The medieval MMO Life is Feudal: Your Own has embraced its "realistic" bona fides a little more tightly with the addition of seasonal weather that have a real impact on the game. Rain is great for plant growth but livestock prefers sunny days, and of course snow can be fun in small doses but for the most part is just an all-around hassle. Piles of snow will actually accumulate during wintry weather, and then melt away when the days turn warmer. It can be used as crafting material for snowballs and snowmen—that's the fun part—but if it's left to accumulate, it will negate the speed bonus that's normally conferred when traveling along roads, and can even freeze and destroy crops. The new weather effects look pretty nice, but developer Bitbox Ltd. warned that rain and snow particles can take a toll on lower-end graphics cards. To counter that, an option to turn the effects off has been added to the video options menu. 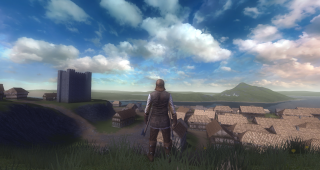 The enhanced weather effects were added to the game as part of an update released the day before Christmas, which also imposed a limit on sprinting to make it more of a “short situational dash” in combat, added large animal traps (which will also work on humans), implemented mass production recipes for charcoal, glass, and linen, and made a number of other changes and bug fixes. Details on all the new features and fixes can be found on Steam.